Philippe Saint-Andre won 69 caps on the wing for France following his international debut against Romania in May 1990. He also skippered his country in almost half of his appearances, taking the arm-band on 34 occasions. He competed at the 1991 World Cup whilst playing for Montferrand, now Clermont Auvergne, as France exited the tournament at the hands of England in the quarter-finals. Saint-Andre was a fiercely committed servant of Montferrand, losing the 1994 French Championship final against Toulouse. He made his second World Cup in 1995, this time losing out to hosts and eventual winners South Africa in the semi-finals. 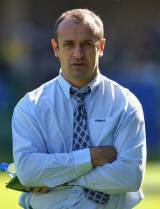 Saint-Andre then left Montferrand for Gloucester in 1996, after eight years with the French club, and following two years playing with the club signed on as coach. After his time in the West Country he returned to France with Bourgoin before joining Guinness Premiership side Sale in 2004. With the Sharks he won the 2005 European Challenge Cup before delivering the Premiership crown at the end of the 2005-06 season. In January 2009 it was announced that he was leaving Sale for a position with ambitious French Top 14 side Toulon. Saint-Andre's arrival as head coach coincided with a massive improvement in the big-spending oufit's fortunes. However, the season was to end without any silverware. They finished second to Perpignan in the regular season standings only to lose out to Clermont in the play-off semi-finals and were upset by Cardiff Blues in the final of the European Challenge Cup, which was played in Marseille. However, after another summer spending free, which saw the likes of George Smith, Carl Hayman and Paul Sackey signed on lucrative contracts, Saint-Andre was confident of leading Toulon to their first French championship since 1992. Toulon reached the last eight of the Heineken Cup but failed to make the French Top 14 play-offs. Just after the start of the 2011/12 season, it was announced that Saint-Andre would be taking over from Marc Lievremont as France coach. This, along with Toulon's faltering form, led to an acrimonious exit for Saint-Andre who left with criticism from owner Mourad Boudjellal ringing in his ears. Saint-Andre's first match in charge of France came against Italy at the Stade de France where he saw his side cruise to a 30-12 triumph. France then dispatched Scotland before drawing at home with Ireland. Against England, however, France fell at the Stade de France and then lost their final match against Wales.